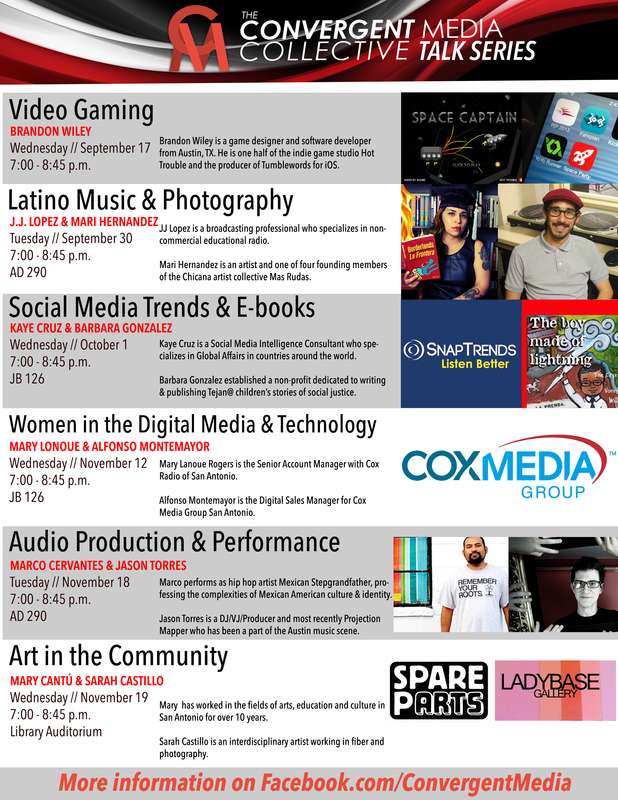 The Convergent Media Collective is proud to host the Fall 2014 CMC Talk Series. The talk series includes a diverse range of speakers and we encourage the public to join us at University of the Incarnate Word. The CMC Talk Series was founded in order to give students and the public at large exposure to a wide array of speakers that discuss their passions, their personal story and how others can go and do amazing things. We encourage all to attend, the idea behind the talk series is not only for you to hear other peoples stories, but for the audience to be able to meet other like minded individuals and network in an effort to support San Antonio’s creative works from the smallest to largest endeavors. So show up a little early and stay a little late and engage with others, that’s what the talk series is all about. Our talks will take place at 7 P.M. on the following dates and at the following locations. *For detailed information about the talks please see the attached PDF.